It’s that time of year again, when finding the perfect holiday gift becomes the sole focus of seasoned and amateur shoppers alike. Or for some, it might be creating a unique holiday outing for that person who already has everything. Luckily for all, a trip to downtown Mystic’s ‘two-year new’ Curated Gallery holds the answers to all of your gifting and celebrating needs! With an eclectic selection of finely curated art and goods from around the globe, the shopping experience here is delightful. The independently owned gallery features an exciting line-up of holiday events, trunk and pop-up shows, wine-tastings and music to add some holiday cheer to your November and December schedules. And the selection of artwork, jewelry, leather goods, and home decor is the equivalent of a shopper’s bliss! Art lover? Pop-up shopper? 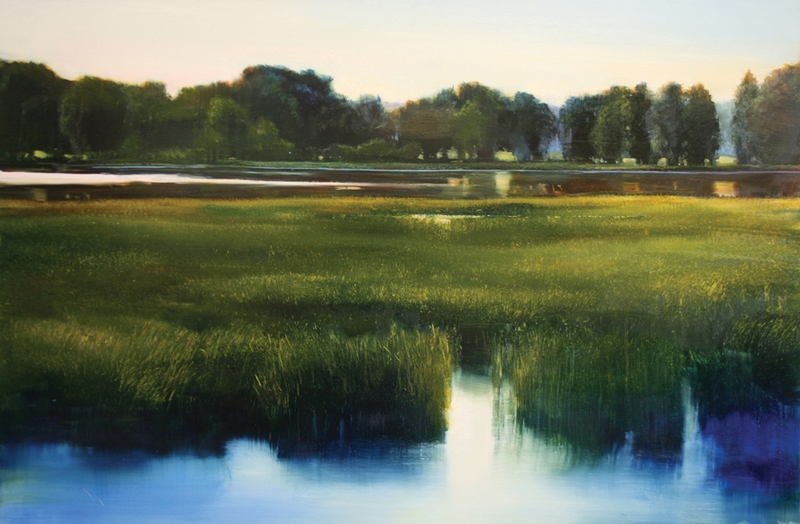 Come to the Opening Reception for local landscape artist Janine Robertson – known for her luminous depictions of the Southeastern Connecticut shoreline – on Saturday, Nov. 17 from 5-7 p.m. Robertson’s glorious pieces will be exhibited until Dec. 31, 2018, and available on the Curated website for an extended period of time. Also on pop-up display through the holidays is the bronze figurative work of Connecticut artist Renee Rhodes. Her emotive forms are studies of the human heart and spirit, and are truly captivating. Make merry with Curated at the two-year anniversary of their own pop-up during Mystic’s annual Holiday Stroll & Luminaria, Tuesday, Dec. 4, from 4-7 p.m. The illustrious founders of the Real McCoy Rum, Jennifer & Bailey Pryor, will be serving tastings of their aged 12-year old rum – a lovely holiday sipper! Music will be provided by the jazzy duet of Ian Kelly on guitar and vocals and Danny Motta on trumpet. And don’t miss the chance to SIP & SHOP at the gallery’s December First Friday event, Friday Dec. 7, from 5-7 p.m.! Saltwater Vineyard will pair up with the gallery, serving a selection of their local wines, while guests have the chance to get their holiday shopping done. Complimentary gift-wrapping by our talented staff will be included with all purchases. First Day: Stuff your Christmas stockings with leather bracelets and cuffs from Spain and Italy. Second Day: Dress up your holiday table with gorgeous recycled glassware in delightful shapes. Third Day: Add warmth and color to your living space with a boldly patterned vintage rug from Morocco. Fourth Day: Put a happy spin on holiday decorating with a selection of whimsical ceramic snowballs. Fifth Day: Adorn your little black dress with a special piece from Susan Cummings’s new jewelry line featuring sterling silver and semi-precious stones. Sixth Day: Wrap up a cozy color block shawl from Isobel & Cleo for someone special. Seventh Day: Fall in love with the buttery leather of Campomaggi hand crafted wallets and handbags from Florence, Italy – gift one and treat yourself to one! Eighth Day: Cheer up your mantle with an original piece of sculpture. Anne-Sophie Gilloen’s whimsical ceramic characters put a smile on everyone’s face. Ninth Day: Take the chill off with a cashmere-blend blanket from Ireland or a kantha quilt from India. Tenth Day: Brighten up someone’s space with hand-dyed Moroccan cactus silk pillows in sun-bleached colors. Eleventh Day: Decorate the tree with a unique selection of artisanal, handmade tree ornaments in ceramic and glass. Twelfth Day: For last-minute shoppers stuck on what to get, a Curated Gallery Membership or Gift Card could be just the answer! And be certain to check out the new artists and collections arriving this month: Jeweler Kate Maller showcases her handmade sustainable pieces using reclaimed 18K gold, silver and diamonds; Polish sculptor Anna Gadek shares her lighthearted “Swimmer” series; and Rachel Ducker from the UK will also be exhibiting her wrapped wire sculptures that evoke the human form. It will be easy to find your holiday bliss at Curated this season! From events to sales, shopping to celebrating, visit Curated to make your season just a little bit merrier. Curated is located at 29 West Main St., Mystic, CT, 06355. For more information, visit www.curated.world/shop; call 800-249-0129 and follow them on Facebook, Instagram and Pinterest.